Members of the prize-winning Philippine Embassy bowling team pose with Consul General Emmanuel R. Fernandez. The team was composed of (from left to right): Eli Sevilla, Ronald Dearao, Jojo Sosa, Helen Prebagren and (on the extreme right) Gil Cuaresma. 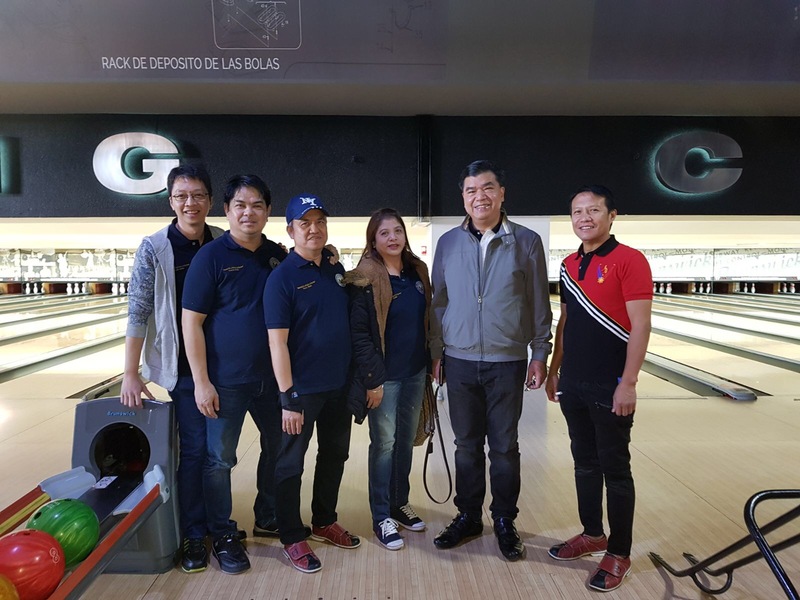 The Philippine Embassy Team garnered the second prize in the ASEAN Bowling Tournament held at the Chamartin Bowling Center in Madrid on 18 November 2017. Six embassy personnel comprised the team, namely: Helen Prebagren, Eleazar Sevilla, Rickie de Jesus, Ronald Dearao, Joseph Sosa, and Frumencio Cuaresma. The team from the Malaysian Embassy emerged as the over-all winner. The Bowling Tournament was organized by the ASEAN Committee in Madrid, a grouping of five ASEAN diplomatic missions based in Madrid.